You know when you find a brand that you fall in love with and every product just works perfectly? Natio is that brand for me. Since discovering this Australian company a few weeks back I have slowly been introducing more and more products from their plant based and mostly vegan skin care range into my routine. 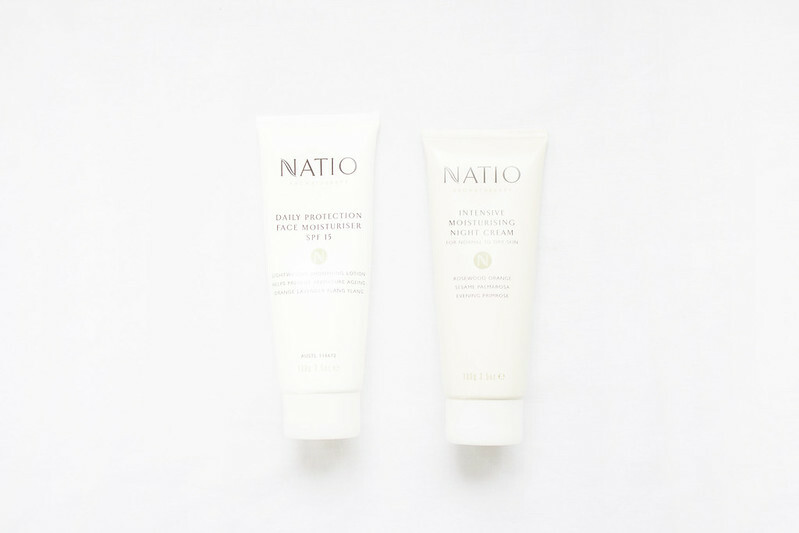 The Natio Daily Protection Face Moisturiser SPF 15 combines Lavender, which softens and repairs the skin, with Ylang Ylang and Orange to calm and refresh, along with an SPF for daily protection. The Natio Intensive Moisturising Night Cream contains Palma Rosa and Evening Primrose, which softens the skin and maintains its suppleness, Sesame helps nourish and balance the complexion, while Rosewood improves radiance, and Orange aids the repair of sun damage. Both moisturisers are creamy with a thick consistency that melts into the skin quickly, both smell luxuriously fragrant due to the natural plant oils but in a subtle and not at all overpowering way. The Daily Protection Face Moisturiser is stiff in texture yet absorbs quickly allowing make-up to be blended easily. Despite the SPF it doesn't leave the skin feeling greasy nor does it leave a white cast. The Intensive Moisturising Night Cream is a lot heavier as it absorbs into the skin while you sleep. The consistency is rich and creamy, which may not suit all skin types (particular more oilier ones), yet works effectively at restoring and hydrating the complexion overnight. Natio is a brand that I have stumbled across a few times but have never read many reviews on their products. They sound very nice Sophie, particularly the night cream however I do wonder like you have mentioned it it may be a bit too rich for my combination/oily skin type. I really love Natio. Their makeup line is also very good. I haven't tried their moisturisers though they have an amazing spot treatment! P.s. Your Blog is fast becoming one of my favourites. Love it! I love Natio as well, and it's so reasonably priced! I'm from Australia so thankfully it's as simple as just popping into the local chemist or department store. I also love their nail polishes, and the cleansing milk face wash . I am also always looking for good moisturizers. I wish they were sold in US. From your description the moisturizers sound wonderful! Is there nowhere you can buy Natio from? In the UK the brand is fairly easy to get from big chain stores and failing that there are several online stockists. Natio is pretty easy to get here, which is awesome because I love the brand. I have the cleansing milk and it's fantastic although I wish I could get a huge bottle since I can only find the tiny ones. They are SUPER lovely and I think they do a range for more oilier skin types. Unfortunately no. I have checked their website and they only deliver to UK, some european countries and I believe Asia. I will try to see if any online stores have it for sale, but looks like I might just have to wait to travel to Europe to get hold of it.